Discover how a bond ladder can help you secure the predictable income of bonds with the flexibility to reinvest if rates go up. Reasons to consider a bond ladder. I sometimes hear from people who want to invest in bonds, but aren't sure if they should jump in now or wait for interest rates to rise. Unfortunately, it's extremely difficult to predict when interest rates will rise or fall, and staying on the sidelines can mean you miss the benefit of current yields. That's where a bond ladder can help. A bond ladder is a portfolio of individual bonds that mature on different dates. For example, you might be able to build a ten year bond ladder with a bond maturing every year. As the bonds at the lower end of the ladder mature, the proceeds can be reinvested at the long end, in new long-term bonds. If interest rates have risen, you'll be able to take advantage of higher yields relatively quickly. And if rates have fallen, you'll still have higher-yielding bonds in your ladder. This can help smooth out the effects of market volatility on your portfolio. You can also use a bond ladder to help manage cash flows. Because many bonds pay interest twice a year, on dates that generally coincide with their maturity date, investors can structure monthly bond income by creating a ladder with a mix of short- and long-term bonds that generate income every month. It would take a large portfolio to meet all of an investor's income needs with a bond ladder alone. But over time, a bond ladder can help ensure that your eggs aren't all in one basket, and can help you manage in a changing interest rate environment. A bond ladder is a portfolio of individual fixed income securities that mature on different dates. This strategy is designed to provide current income while minimizing exposure to interest rate fluctuations. Instead of buying bonds that are scheduled to come due during the same year, you purchase bonds or CDs that mature at staggered future dates. Primary goals of a bond ladder. There are two primary goals a bond ladder can help investors achieve. By staggering maturity dates, investors avoid getting locked into a single interest rate. For example, say an investor bought a single five-year bond. If interest rates were to rise two years from now, the bond would still be paying interest at the lower rate. A ladder helps smooth out the effect of fluctuations in interest rates because there are bonds maturing every year, quarter, or month, depending on the number of rungs in the ladder. When a bond matures, an investor could reinvest that principal in a new longer-term bond at the end of a ladder. They'll benefit from a new, higher interest rate and keep the ladder going. If interest rates were to fall, unfortunately the maturing bonds would likely be reinvested at lower rates, but the bonds at the end of the ladder will have likely locked in higher yields already. A bond ladder also helps to manage cash flows for particular needs. For example, since many bonds pay interest twice a year on dates that generally coincide with their maturity date, investors can structure monthly bond income based on coupon payments with different maturity months as well as years. How a bond ladder works. With bond laddering, you invest in multiple bonds with different maturities—which is designed to give you the predictable income you expect from bonds and the flexibility to reinvest your principal. Here’s an example of how a ladder works. In this example, you buy four bonds with staggered maturities. Your combined average annual yield is 2.125%. In two years, when Bond A matures, you reinvest the proceeds in a new bond, extending your ladder. You can continue to do this as bonds mature in the future. This hypothetical example is for illustrative purposes only. It cannot predict or project the return of any specific investments. While predictable, bond income is not guaranteed and is subject to call risk as well as possible default on principal and interest (which increases with lower-rated securities). Schwab suggests purchasing a minimum of 10 securities for diversification. How to build a bond ladder. 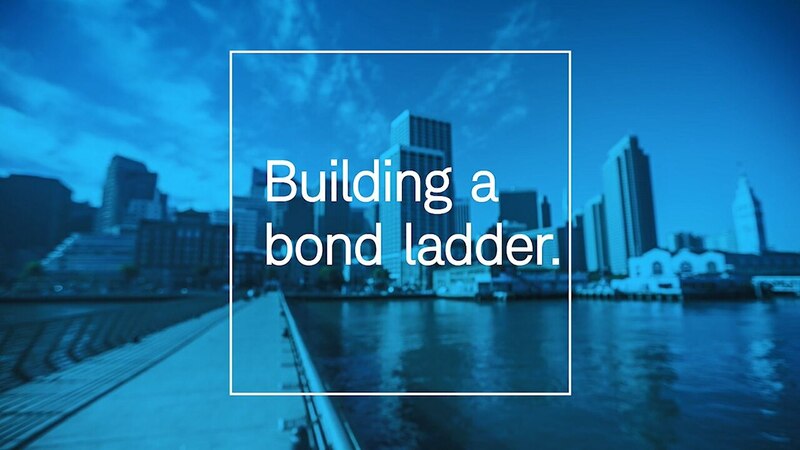 The bond ladder itself is fairly straightforward to create. The overall length of time, spacing between maturities, and types of securities are primary considerations when building a bond ladder. Even in a low or rising interest-rate environment, bond ladders can help to balance the need for income while managing interest-rate risk. Rungs: Take the total amount that you plan to invest, with the goal of extending the ladder as long as possible. For example, we recommend a minimum of $100,000 to buy individual bonds, which could be invested with 10 rungs of $10,000 each. An additional benefit to having at least six rungs is that an investor can create a ladder structured to generate income every month of the year. Spacing: The distance between rungs is determined by the span of time between the maturities of the respective bonds, which can range from months to years. Generally, the spacing should be roughly equal. The longer the ladder, the higher the income is likely to be, since bonds with longer maturities tend to offer higher yields. This does increase the interest-rate risk (price sensitivity to changes in interest rates). Shortening the bond maturities generally reduces income and interest-rate risk, but it allows the principal from maturing bonds to be reinvested at higher rates should interest rates rise. Materials: Just like a real ladder, investors can build their ladders with different materials, in other words, different types of bonds or CDs. Moreover, investors can also utilize the potential tax advantages of municipal bonds, the credit guarantee of U.S. Treasuries, or the generally higher yields of investment-grade corporate bonds. As each bond or CD matures, reinvest the principal in new bonds with the longest term you originally chose for your ladder. If interest rates move higher, you can reinvest at higher rates. If rates fall, you'll still have some bonds locked in for the longer term at higher yields. Be sure to consider the risks of investing; talk to a Schwab Fixed Income Specialist about managing risk. Call a Fixed Income Specialist. Our Fixed Income Specialists can provide personalized assistance on pricing or any bond investing questions. Working directly with our trading desk to locate hard-to-find issues, they can also seek better prices on large block trades or securities with specialized criteria by contacting other firms with which we have a relationship. If you are interested in selling bonds from your portfolio, you will need to contact one of our Fixed Income Specialists at 877-906-4670.